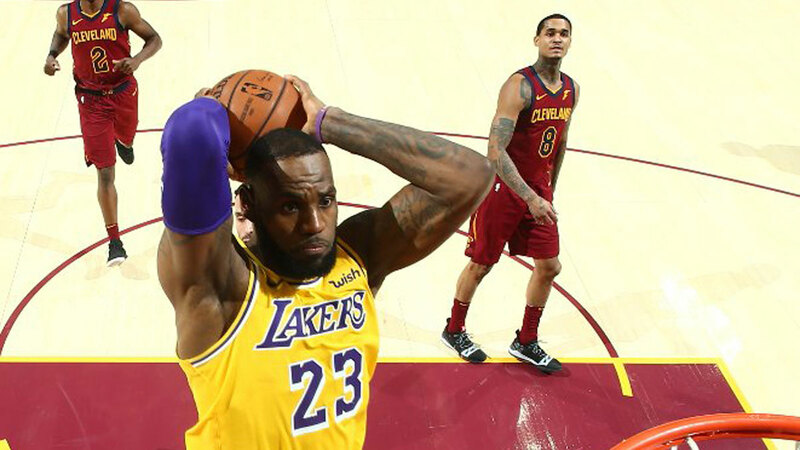 LeBron James—now a Los Angeles Laker—came back to Cleveland on Thursday, and the experience turned out to be the exact opposite of his initial homecoming in 2010. Unlike the hostile reception he received when he was with the Miami Heat, Cavaliers fans warmly embraced LeBron in his first return after departing the team for the second time as a free agent. He even said postgame, "I appreciated these fans just as much as they appreciated me." The outcome, however, was the same: James breaking the hearts of the familiar fanbase. During a timeout in the first quarter, the Cavs showed an emotional video of LeBron's massive influence on and off the court, from "The Block" to the I Promise School—only fitting for the hometown hero who ended the city's 52-year championship drought. At the end of the day, the King was moved but wasn't softened up by the shower of love. He finished with 32 points, 14 rebounds, seven assists, and a block, to lead the Lakers to a 99-91 comeback win—scored or assisted on 11 straight points in the 4th. It's one thing to follow an NBA superstar to whichever team he joins, it's another to flaunt "bandwagon branded gear," as commented by one netizen. Not sure if they are fans or making fun of Lebron, but those "blended" unis look awful. Speaking of bad looks, the sight of James doing a complicated dap routine with a former teammate and current opponent, Tristan Thompson, wasn't very amusing (Just ask Kyle Kuzma). League conspiracy theorists be like: LeBron coming home again in 2022? In the words of Stephen A. Smith, this tweet is "blasphemous!"